Hands-down, spring is the busiest time for building inground swimming pools—but that doesn’t necessarily mean it’s the best time to build your new backyard oasis. In fact, homeowners who look to start the construction process in the spring or early summer may want to reconsider. Here’s why: In in the fall or winter, you may find that pool contractors have more to offer. Their levels of client service may increase, completion times may be quicker, and better deals on pool contracts may be more readily available. Naturally, most potential pool buyers begin thinking about a refreshing backyard resort in the spring when temperatures are climbing. As a result, the busiest time for pool contractors most everywhere is March to August, with many buyers eyeing Memorial Day for their first pool party. Think of the pool-building rush in spring the same way you do about rush-hour traffic: At five o’clock during the work week, more commuters are clogging the same major roads, and it takes longer to get to your destination—and with a lot more stress. A similar kind of bottleneck occurs when so many homeowners decide to embark on a new pool around March or April. Savvy commuters leave work either earlier or later to beat the maddening rush-hour gridlock, and you can apply a similar tactic to beginning work on a new backyard resort. Any number of personal factors will influence the best time of year for you to put in a backyard pool. But if you can wait to start the process in the offseason (September to January in most parts of the country*) you may reap some valued-added benefits. Each situation is unique. In many cases, building your project in season is fine and will get you a fabulous new pool. 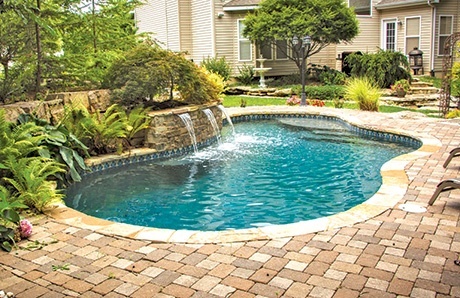 However, in some scenarios, avoiding the construction season may pay off: You may encounter fewer roadblocks and find greater flexibility from pool contractors willing to work within your budget, timeline, special requests, and with any unique needs your project or backyard conditions may require. In most cases, reputable pool builders can work with you most any time of the year to design and create the pool of your dreams. Traditionally, they have fewer projects to build when summer ends. As a result, fall is when they can take advantage of building lulls; they have more opportunities to go above and beyond with their customer service and overall project management. And they want to keep their work crews and sales teams busy. In the offseason, prospects increase for extra-attentive service, more experienced tradesmen on the job, flexibility to build at out-of-the-way properties, more time available for complicated designs or construction challenges, and faster approvals for permits and variance requests. Many pool builders execute nearly a year’s worth of business in about six to eight months, during spring and summer. With an onslaught of prospective customers in a short time frame, human nature kicks in: Sales staff and company owners sometimes focus on the customers who are the easiest to serve. These are the customers who are more knowledgeable about pools or who may have already owned one before—and therefore have a pretty good idea of what they want. This group may also include those with simple projects and routine building conditions on their property. What does this time crunch and heavy customer load mean if you’re a first-time pool buyer? Well, since purchasing and building a pool is a new process for you, you will probably have lots of questions. So your best bet is a pool builder who can give you more time and attention during the design process, as well as during construction. When pool season slows and comes to an end, it’s simple: The theory of supply and demand kicks in. Builders have more time on a day-to-day basis to devote to individual clients. Sales staff can spend more time walking you through the process, design choices, and technical matters. In the fall and winter, staff members like the construction scheduler and job superintendent can spend extra time talking with you and reviewing various details of each phase of the building process. It’s sort of like dining at a restaurant. When the establishment is packed, you can still get a great meal and good service from the wait staff. But when most of the tables are empty, the odds increase that your server can be more attentive and the chef has time to cater to any special requests. Like hotels, gift retailers, tourist attractions, and many home improvement contractors, the kind of business activity that pool builders conduct is subject to seasonal highs and lows. In the busy spring and summer, pool companies are juggling multiple job sites. Like other kinds of seasonal businesses, they sometimes hire interim labor to help out. Temporary staff members may be dedicated and hard working. However, like seasonal teams in most any company, the best employees with the most skills and experience are the ones who get kept on year-round. So it stands to reason that permanent, year-round staff members are more likely to be the cream-of-the-crop of the local tradesmen. Bottom line: By building your pool during the offseason, you boost the likelihood that the crews working for you are those with the best skills and most experience. Let’s say you live 100 to 150 miles away from the home base operation of a local pool company. When the contractor’s busy in the summer building multiple pools, the truth is that it’s simply not practical—or good business strategy—to take on your far-away project. Sending work crews two hours away—four hours round trip—gobbles up too much valuable work time when multiple jobs are under construction. Additionally, the reality is that pool designers/consultants with plenty of customer sales appointments in April and May are going to be reluctant spending four hours driving on a day when they could fit in a second appointment close to home. In the offseason, when business slows down, pool builders have more time to spare crews to work on job sites farther away—in rural areas or other geographically out-of-the-way locations. In fact, pool designers/consultants who typically have very few sales leads to pursue during the fall and winter will likely be happy to jump at the chance to drive out to your distant home and develop a plan for your backyard. Elaborate designs and features create an amazing look and deliver jaw-dropping backyard beauty, but they will take longer to complete and require more hands-on job supervision by the most skilled tradesmen. Again, in the spring and summer when pools contractors are handling numerous projects, a single intricate, upscale one might take double or triple the ordinary time to finish. In cases like this, your pool contractor might recommend that you hold off until the offseason. If you don’t want to wait, your first-choice builder may be forced to pass on the project. Professional pool builders want to make their clients happy, so they know it’s usually more realistic to take on more challenging projects when they can devote the appropriate level of time and oversight to achieve a top-notch, quality result. Sometimes, another factor that eats up time when building a complex pool design is what must happen before construction even begins: obtaining permits from the local municipality. In some cities and counties, the building department faces a backlog during the spring and summer with requests for permits for pools, as well as other home improvements. Many permit departments can handle the load, but some—especially those that have cut back on staff levels—can’t process the load as efficiently. If you live in a city with a building department that encounters summer backlogs, that backlog will likely decrease in the offseason. Variance requests are another reason for some pool buyers to build in the offseason. These construction requests seek waivers from current zoning requirements, and they permit land use in a manner not otherwise allowed by local ordinances. For example, say your home is on a corner lot in your neighborhood, and your pool needs to be built partially on your side yard, due to the size and slope of your backyard. Local zoning might consider your side yard as frontage, and it may not allow structures on frontage. But in your case, an exception to the rule would be appropriate. However, you will need to request a kind of waiver known as a land-use variance. Now, it’s not that cities will be more lenient in granting variances in the offseason. Rather, it’s the issue of speed. As is the case with building permits in the fall or winter, the personnel who review and grant variances are not so backlogged with requests. So, if your property may need a variance to allow for a new pool or a particular design or configuration, and if the local agency has a reputation for taking a long time for granting approvals, that’s one more reason to consider holding off until pool season has passed. A variety of backyard conditions may pose construction hurdles that can slow down the build process during any time of the year. If a backyard is hilly and will need extensive grading; if it has overhead power lines that need relocating; or, if there are underground rocks that must be dealt with—the extra time the offseason provides these and other issues can be helpful. And if something like an air conditioner unit needs to be moved—to allow backyard access for heavy excavation equipment—it’s far better to be without cooled air for a short time in the fall than it is in the summer. Of course, every case is different, so building in the offseason may not make a difference in every situation. But if your backyard poses some extra building obstacles, it’s certainly worth discussing with your pool contractor. Will your plans for putting in a new pool include a major landscaping makeover as well? In parts of the country with warm or temperate climates nearly year-round, autumn can be ideal for planting. For certain kinds of shrubs, and flowers, a fall landscape installation provides a chance for young plantings to take root. Then, come spring and greater use of your backyard and new pool, the surrounding foliage is flourishing and ready to bloom for your enjoyment. Looking to remodel or upgrade your pool? Many pool builders simply won’t do remodels during the busy season and will recommend doing this work in the offseason. That can be good for you: Waiting until fall to remodel makes sense since it allows you to use the pool during the summer; in fall and winter, in many parts of the country, you will use your pool less or not at all anyway. Also, you may be able to take advantage of some of the same points discussed above for a better construction process—and read on to learn how you may be able to save money or get a better value on fall/winter remodeling jobs. Would you like to be enjoying your pool by the spring of 2018? But would you rather pay 2017 prices for your new backyard addition? Like the cost of goods and services in many industries, pool construction and equipment pricing usually go up at either the beginning of each year or right before the busy spring/summer season. Even if a pool builder does not raise construction prices the particular year in which you are building, the equipment costs almost always do since manufacturers increase their prices on an annual basis. That’s plenty of pocketbook-powered incentive to get a tactical jumpstart on your project; begin building your pool in fall or winter of 2017. By doing so, you might be able to lock in current year pricing before any increases take effect. For contract savings and overall value in mind, another reason to go pool shopping in the offseason is to give you a better shot at landing a deal—or at least some value-added additions with your purchase. Traditionally in the offseason, some pool builders are more willing to compromise a bit on price or give upgrades on equipment. It makes sense: Deals are always easier to get when supply is greater than consumer demand. In general, it’s easier to bargain with most any business for better (or more) goods or services than it is for a lower price. The reason: It’s almost always more affordable for a company to provide an upgrade or even a freebie product, versus taking less for the purchase price. When business is slow, pool builders may be more open to granting some kind of value added. For example, you might be able to persuade them to sweeten the deal with three months of free weekly pool service, an energy-efficient two-speed pump for the price of a regular one-speed pump, or an extra 100 square feet of deck with the 500 square feet you are buying. Building a swimming pool in the offseason can provide benefits in some cases, and it may even save you money or win you some free upgrades. And here’s one final bit of incentive for building in fall or winter: It can minimize the amount of time you lose enjoying your backyard pool during construction. Especially in areas around the country where the temperature does not allow for year-round swimming, why not build the pool in the offseason—during a time when you couldn’t be using it anyway? This way, it will usually be ready before the next season kicks in; when warm weather arrives you’ll have an entire spring and summer full of refreshing aquatic fun! *The busy period or “season” in some markets vary in length and timing. For example, in southern California, the temperate climate makes the pool season start earlier and run longer. In some Florida markets, the season is “reversed; the influx of “snowbirds” escaping freezing Northeast winters create a construction rush that begins around October and ends in early spring.